When I first starting quilting by hand, I had no idea what I was doing. I used embroidery needles instead of sharps, and had a hard time finding good quilting thread. I thought I needed to wax my thread, but soon discovered that this is unnecessary when using a good quality hand quilting thread. I remember going into our local quilt shop (this was in 1999) and asking for turquoise hand quilting thread. The shopkeeper clearly stated that "turquoise is not *in* right now" and led me to a rack with navy, hunter green, ivory, tan, and burgundy thread for handwork. Needless to say I was disappointed! 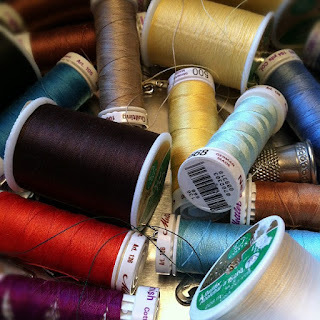 Shortly thereafter I discovered the Mettler 100% cotton quilting thread, which is very easy to find nowadays. They even stock it at our local big box craft store. It comes in a great variety of colors, and is available in a few different spool sizes. It makes a world of difference. I never need to wax it, and can work with a length of up to 36" without any issues with knots or tangling. I am presently working through my cookie tin of thread, using different colors for each spool and end cap. This keeps me happily occupied while I stitch. Stop inspiring me to take up quilting! I need another fiber hobby like I need a hole in the head ;) You make it look so feasible. Hope you had a nice Thanksgiving. Oops, am I being a fiber enabler? That is how I felt about learning to spin, but now I cannot imagine *not* sitting down at the wheel whenever I can! I think quilting is great, especially when you can do some of the work by hand, as it is so portable that way. Thanksgiving was great, I hope yours was, too!